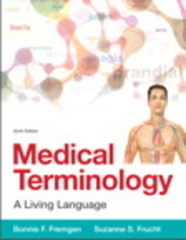 Medical Terminology 6 Edition With 14 streamlined chapters covering essential A&P topics, this mid-sized book is the perfect fit for a one-semester course in medical terminology. It also serves as a useful reference for practicing professionals. Build a strong foundation of medical terminology, step by step Medical Terminology: A Living Language uses a carefully constructed learning system to help readers gain a successful grasp of medical language within a real-world context. Its step-by-step approach introduces the anatomy and physiology of body systems and their corresponding medical terms, as well as the rules of using word parts to form medical terms. New exercises and tips give readers the hands-on practice they need to achieve mastery. Rather than simply memorizing terms, students will gain the understanding to work with all terminology, regardless of its etymology or origins, so they can interpret unfamiliar terms they will encounter in the future. Also available with MyMedicalTerminologyLab™ This title is also available with MyMedicalTerminologyLab–an online homework, tutorial, and assessment program designed to work with this text to engage students and improve results. Within its structured environment, students practice what they learn, test their understanding, and pursue a personalized study plan that helps them better absorb course material and understand difficult concepts. No matter their learning style, students will build a solid foundation of medical language through MyMedicalTerminologyLab’s interactive games, Dynamic Study Modules, and narrated lectures. NOTE: You are purchasing a standalone product; MyMedicalTerminologyLab does not come packaged with this content. MyMedicalTerminologyLab should only be purchased when required by an instructor.